Wii Sports is a 'various sporting activities' game with a new sense of immersion that, at the time of its release, currently does not exist with all that many games on the market. 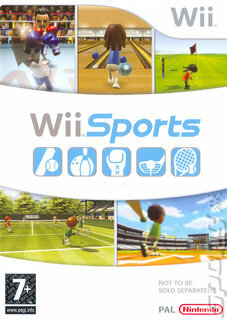 The game comes bundled with the Nintendo Wii and consists of five different sports all played in different and enjoyable ways. The most competitive of all the games is tennis, which allows up to four players to compete against each other to see who becomes the king of the court. You play tennis by mimicking the motions you would if you played real tennis whilst holding the Wii-mote in your hand. This allows you to play forehands, backhands, volleys and basically any other shot you could think of, as well as allowing you to set speed and angle as to how fast you swipe the remote and at what angle the Wii-mote is at in your hand. Baseball is as natural to play as tennis, with the player holding Wii-mote like a bat when batting and 'throwing' it like a ball when you are pitching. When pitching, you can select whether a ball will be 'fast', 'curve', 'screw' or a 'splitter' by holding down one of or a combination of the B and A buttons. However, the real skill comes in when you begin to bat, as you need to be able to not only put the power into your swing but also swing at the correct time to get that all important home run. Bowling allows up to four players to compete to see who becomes lord of the strikes. You play by holding down the B trigger and doing a bowling motion towards the motion bar, before releasing to launch the ball down towards the pins. You can create specialised curving shots by rotating the Wii-mote whilst bowling. Golf invites up to four people to attempt to achieve the elusive prospect of getting a hole in one and having the ability to mock all of your friends and colleagues. This game has the much more difficult prospect of having to create almost perfect accuracy if you have any hope of keeping out of the rough. You play by swinging the remote in much the same way you would if you were playing golf in real life, but the real difficulty comes in trying to determine the correct amount of power by swinging the remote to just the right point. Boxing is the only game that requires the player to not only have a Wii-mote but also a Nunchuck controller, and if you are playing this in two-player mode, the second player will also require a second Wii-mote. You thrust the Wii-mote and Nunchuck directly at the TV to attempt to hit an opponent's head and body. You can also block punches by holding the Wii-motes up in a boxing stance, and dodging is merely leaning backwards or side to side. Each of these games are stand-alone classics in solo mode, but when you throw other players into the mix they, really come into their own allowing for a mix of competitive, strategic and truly entertaining elements.